A powerful anti oxidant that assists in maintaining heart health, in particular heart muscle function. Blackmores Flaxseed Oil 1000mg is a source of beneficial omega-3, omega-6, and omega-9 fatty acids. Equazen Eye Q is a combination of the specific omega 3 and omega 6 fatty acids required for optimal eye and brain function. To provide the essential fatty acids to assist in the healthy functioning of the cardiovascular system. Natures Way Garlicin supports healthy cholesterol levels and helps maintain circulatory efficiency. Helps in maintaining normal cholesterol levels. Go Co-Q10 160mg is a high ptency, 1 a day dose. Co-Enzyme Q10 is a natural substance essential for cellular energy production known as ATP (Adenosine Triphosphate). Co-Enzyme Q10 is found in every living cell in the body and supports the health of the heart, energy levels and is a known powerful antioxidant. Co-EnzymeQ10 (CoQ10) is an essential component of the mitochondria - the energy producing part of the cell and is often referred to as nature�s spark-plug. 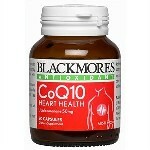 CoQ10 is a potent antioxidant and free radical scavenger; it supports heart muscle health and may help maintain healthy blood pressure.